(Newser) – In a striking speech delivered from deep below the ocean's surface, the Seychelles president on Sunday made a global plea for stronger protection of the "beating blue heart of our planet." 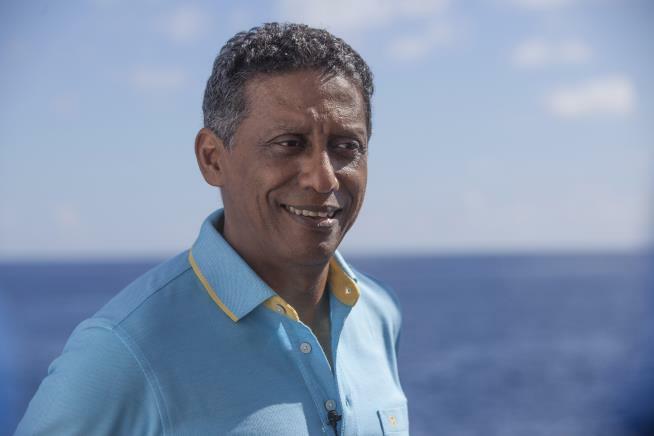 President Danny Faure's call for action, the first live speech from an underwater submersible, came from one of the many island nations threatened by global warming. He spoke from an ambitious British science expedition exploring the Indian Ocean depths. "This issue is bigger than all of us, and we cannot wait for the next generation to solve it. We are running out of excuses to not take action, and running out of time," the president said from 400 feet below the waves, on the seabed off the outer islands of the African nation. Wearing a Seychelles T-shirt and shorts, the president told the AP that the experience was "so, so cool. What biodiversity." It made him more determined to speak out for marine protection. "We just need to do what needs to be done. The scientists have spoken." The oceans' role in regulating climate and the threats they face are underestimated by many, even though Faure points out they generate "half of the oxygen we breathe." Marine scientists from the University of Oxford have surveyed underwater life, mapped large areas of the sea floor, and gone deep with manned submersibles and underwater drones. By the end of the mission, researchers expect to have conducted over 300 deployments, collected around 1,400 samples and 16 terabytes of data and surveyed about 25,000 square meters (269,100 sq. feet) of seabed using high-resolution multi-beam sonar equipment. The data will be used to help the Seychelles expand its policy of protecting almost a third of its national waters by 2020. The initiative is important for the country's "blue economy," an attempt to balance development needs with those of the environment. 3 men have Explored the Marina Trench.. 15 have explored the Moon. If we spent 1/10 the Energy and Money on Earth Sciences that we spend attempting to Find the origins of God in Deep Space.. The Earth and MAN would be 1,000,000,000 X better off..
Danny, well said. Time to act for our great grandchildren's future, rather than our back pocket.